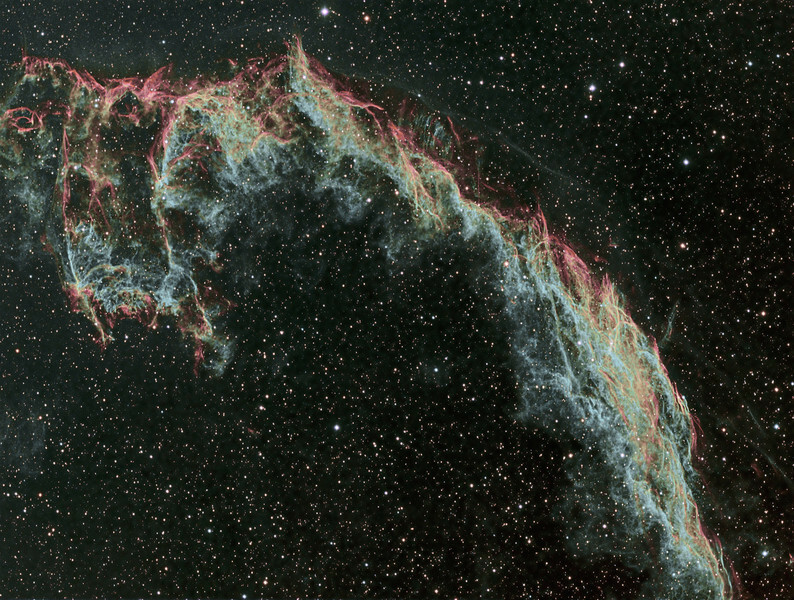 Eastern Veil NGC 6992 (part of the Cygnus Loop) in narrow band. 12 hours of exposure, 4 hours each OIII, Ha, SII as RGB. Bin 1x1 with FLI ML8300 camera and TEC140 @f7. Taken by Lynn Hilborn, WhistleStop Obs, Grafton, Ontario...July 15,21,26,2011. One day just prior to the dawn of recorded history a brilliant light flashed suddenly in the night sky, its light unrivaled by any existing stars. The "new" star undoubtedly captured the imagination of early observers who likely struggled to explain its origin and interpret its meaning as it faded from sight over several weeks. We now know the sudden flash of light represented an extremely rare supernova occurring in our own galaxy some ten thousand years ago. Although the star was annihilated in the blast an immense glowing nebulous arc was left in its wake which we now call the Cygnus loop or Veil Nebula complex. The Cygnus loop spans some 80 light years and 3 degrees of summer sky in the constellation Cygnus. The delicate tendrils of glowing gas are not the remains of the dying star but are caused by an advancing shock front of the supernova as it crashes into the stationary gases of the interstellar medium. The expanding shell of material blasted from the dying star collides with stationary gases at high speeds (up to 1.4 million kilometers per hour) energizing the gas molecules. The gases then release the newly acquired energy in different wavelengths which include the brilliant colors of the visual spectrum. In some regions the gases are heated to millions of degrees causing the release of high energy x-rays. Ultimately the supernova remnant will dissipate over thousands of years returning some of its heavier elements like gold, calcium, iron to the interstellar medium. It's a humbling revelation to know the iron in our blood and calcium within our bones had its origin in the cores of ancient stars. Text courtesy of Robert Gendler.